“Dongguan enjoys an incredible basketball atmosphere! I see children 6 years old who command excellent control of the ball and play with impressive skills.” - Frank Leenders, FIFA’s Director of Media and Marketing. “During the past few years, four cities in Guangdong province have had experience organizing international competitions, which demonstrates their capacity to hold a successful Basketball World Cup. While benefiting from such high-level competitions, these four cities are bound to improve their basketball skills and tactics.” - Liu Kejun, Vice Chairman of the Organizing Committee, Executive Deputy Secretary General, Vice Chairman of the China Basketball Association, and Director of the Guangdong Provincial Basketball Association. “To host the FIBA Basketball World Cup will be of great significance to Dongguan, the city of basketball. The World Cup will make our city more dynamic, influential and wonderful!” - Huang Huihong, Director of Dongguan Sports Bureau. On the evening of 11th September 2018, at Wanda Plaza in Dongcheng of Dongguan, the one year countdown to the Basketball World Cup started amidst mighty drums. Following Beijing, Shanghai, Nanjing, Wuhan, Shenzhen and Foshan, Dongguan is the 7th city to host the launch of the countdown clock to this great event. 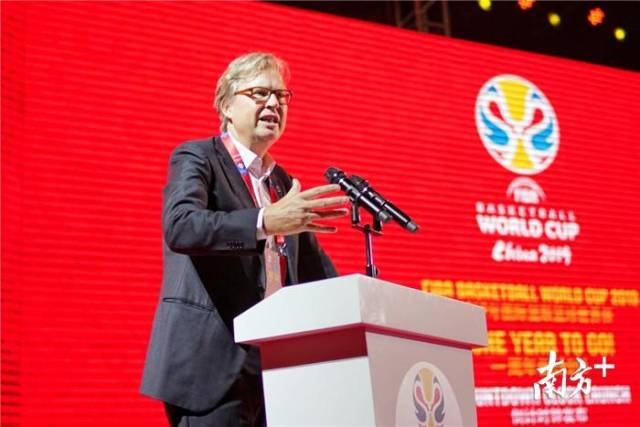 In his speech, FIFA’s Director of Media and Marketing, Frank Leenders, fully recognized the Dongguan’s efforts for the preparation and promotion of the Basketball World Cup. He then awarded the host city plaque to the Dongguan Organizing Committee on behalf of FIBA. “The one-year countdown event marks that preparations for the 2019 FIBA Basketball World Cup have entered a crucial stage. We hope that Dongguan division will take this as a new starting point, unite all parties with wisdom and innovative ideas to achieve the goal of holding an excellent and superior basketball event, thus ultimately making positive contributions to the development of world basketball!” said Mr. Liu Kejun (Vice Chairman of the FIBA Basketball World Cup Organizing Committee, Executive Deputy Secretary General, Vice Chairman of the China Basketball Association and President of the Guangdong Basketball Association). “Next summer, Dongguan will be crazy for basketball!” said Mr. Yang Xiaotang (Director of the Dongguan Division Organizing Committee, Member of the Dongguan’s standing committee and Director of the Propaganda Department of the CPC Dongguan Committee), who also swore that the Dongguan Division will successfully complete organizing tasks according to stricter standards and hard work under FIBA leadership (the Basketball World Cup China Organizing Committee and the Guangdong Provincial Organizing Committee). “Three! Two! One!” Guests at the ceremony jointly pressed the host city icon of Dongguan, officially unveiling the countdown clock to the 2019 Basketball World Cup. Frank Leenders, Wang Xuan, Liu Kejun, and Yang Xiaotong jointly illuminated the 2019 basketball World Cup countdown clock, which officially marked the crucial one-year countdown to the event. 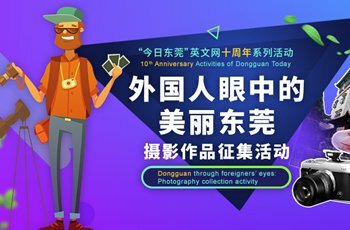 The preparations in the Dongguan division will also enter a key stage. During applause, Yi Jianlian, a star player from the Guangdong Tigers basketball team arrived. Yi, nominated as the “Ambassador of the 2019 FIBA Basketball World Cup for Guangdong Region”, who is currently training in the US, sent an encouraging video and well wishes for the up-coming Guangdong event. Huang Wenwei, Xiao Hailiang, Zeng Bingqiang, from Dongguan (recent gold medal winners for China in the Three-men Basketball in the Jakarta Asian Games), as well as little players from Team Dongguan Changping Warriors Wolves (Champions of the South China division at China Small Basketball League), also attended the activity and gave face-to-face time with fans to share their basketball skills. The final stage of the 2019 FIFA Basketball World Cup will be held in China between 31st August to 15th September 2019. 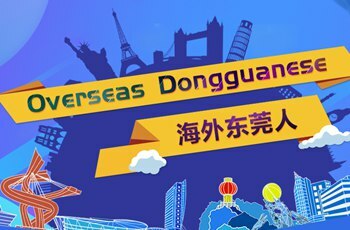 As Dongguan is one of the eight host divisions, basketball fans will be able to enjoy the high-level competition closely.